It’s time for a lovely stroll through the dense forest where you’ll encounter the wonderful wildlife that it inhabits with the ultimate aim being to locate the magic tree which can transform stone into gold and see you escaping the wilderness with huge rewards! The thick leaves of trees surround the reels with your journey into the heart of the forest seeing you encounter all kinds of animals from wolves that have a menacing look of hunger on their face, bears that roar loudly when they spot you, foxes that lick their lips after catching sight of their prey, and a rather sweet looking deer who is presumably dinner for the aforementioned animals! In addition to spotting animals, you’ll also get to experience spinning the reels for free with an exciting free spins mode that offers a special expanding symbol, plus standard EGT features of a gamble mode and the Jackpot Cards game are also included in this majestic slot! 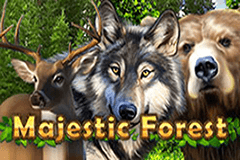 The Majestic Forest slot machine is played across 5 reels and 10 paylines (though the paylines can be altered enabling you to play with 7, 5, 3 or 1 activated should you be unable to afford playing all of them, but this isn’t a tactic I’d recommend) and it boasts an enticing return to player percentage of 96.19% with five different betting options to choose from – either 10, 20, 50, 100 or 200. This majestic experience through the forest presents you with lots of eye catching moments to remember with the iconic magic tree, four animals, and five playing card symbols featuring as symbols on the reels to spin in winning combinations. Interestingly the Wild symbol also triggers the free spins feature in Majestic Forest whereas we usually see Scatter or Bonus symbols used to trigger bonus features, but we won’t complain – that just means more chance of landing this symbol. The Wild is represented by an extremely thick tree with a stone in front of it and once you land it as part of a winning combination (it can substitute for all other symbols) the stone is turned into gold, while three or more triggers the free spins mode. Striding through this dense forest will also see you encounter four different animals, and it’s interesting that even landing two symbols of a specific animal sees you receive a payout too, rather than requiring a minimum of three which is typical. The most valuable of these, and in fact the whole game, is the massive brown bear which growls with five on a payline resulting in a 500x your stake win. Wolves, foxes and deer also feature and the reels are completed with Ace to 10 playing card symbols that have been designed in the style of a leaf with a different colour used for each one. You’ll be enjoying the delicious fruits of the forest as you spin the reels for free in the rewarding free spins bonus game once you land three or more of the Magic Tree symbols anywhere on the reels. This feat not only sees the stone transform into gold but dramatic jungle sounds loudly ring out in anticipation of your free spins as you are presented with an overview screen stating that you have won twelve free spins with a special expanding symbol included – which is randomly chosen, before you are then prompted to click the start button to begin spinning the reels at no cost. Throughout your free spins, each and every time the symbol that was selected to be the special expanding symbol appears on the reels, it will expand to cover that whole reel in order to create additional winning combinations. In addition to this, free spins can also be retriggered simply by landing three or more of the Wild trees symbols which sees twelve more spins added to your current total and the special expanding symbol that was selected at the beginning remains active! The forest has been a popular setting for EGT, with one of my favourite slots from them being the Fortune Spells slot machine, so I was really looking forward to navigating my way through this enchanting forest to see what it had to offer. Thankfully the Majestic Forest slot machine lived up to my high expectations boasting a beautiful design, fun animations of animals when they are part of winning combinations, and a very rewarding free spins feature which I found triggered with relative ease and never failed to result in big wins for a majestic experience each and every time!